What happens when you eat your favorite food? Maybe it’s a slice of pizza or chicken nuggets. You know it tastes yummy, but what happens next? When your stomach is empty, you feel hungry. If you smell good food, your brain reminds you that you’re hungry. You take a bite, chew the food up and swallow it. Saliva, or spit, makes the food soft and gooey. Once you swallow your food, the process of digestion starts. That yummy pizza or chicken nugget goes on a trip that is more than 30 feet long through your digestive system. First, the food travels through your esophagus, which is a tube that pushes the food down to your stomach. In the stomach, the food mixes with juices in your stomach. These juices are acids. They dissolve the food and break it down. The food continues its journey through the small and large intestine. About a day later, what’s left comes out – as poop and pee. Along the way, the liver collects nutrients from food so your body can use it. The gall bladder and pancreas send juices to the intestines to help with digestion. The large intestine takes water and minerals out of the leftover food but that’s not all about your digestive system. The small intestine sends nutrients into the bloodstream. The large intestine takes water and minerals out of the leftover food. 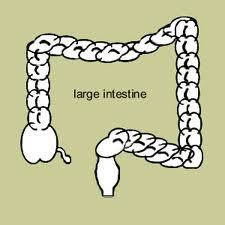 Doctors can take x-rays of the intestines. A patient drinks a special drink called barium. Then the doctor can see the intestines on an x-ray. Read “Curious George Goes to the Hospital” to learn more about this. If you love chocolate, you’re not alone. Americans chomp down 2 billion pounds of the stuff every year. A video of how a hamburger travels from the mouth to the end of the digestive track. Question: Why is it sometimes hard to go poop? Answer: Sometimes you might get constipated. Your poop is hard and dry and going poop might hurt a little. Tell your parents if you’re constipated. Drink more water and get exercise. Cut down on foods like cookies, candy and bread. Eat more veggies, fruit and whole grains. You’ll probably feel better soon. Question: Why do I sometimes get a stomachache? Answer: Sometimes stomachaches happen if you’re feeling stressed or nervous, but most of the time, you get a stomachache because you ate something that didn’t agree with you. To feel better, avoid greasy foods like French fries and hamburgers. Eat plenty of veggies, fruit and whole grains. Enjoyed the Easy Science for Kids Website all about Your Digestive System info? Take the FREE & fun all about Your Digestive System quiz and download FREE Digestive System worksheet for kids. For lengthy info click here. Declan, Tobin. " 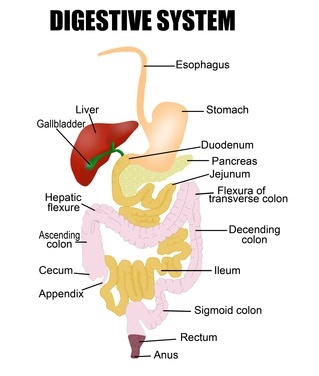 Digestive System Facts for Kids ." Easy Science for Kids, Apr 2019. Web. 23 Apr 2019. < https://easyscienceforkids.com/all-about-your-digestive-system/ >.